While on their way to Alpheridies Daereon’s parents were attacked by pirates. Though Daereon’s father tried his best to evade them they ended up crash landing on Kashyyyk. Daereon’s mother was pregnant and they could not afford to leave the ship with all the supplies,but the pirates tracked them down. However Daereon’s father did his best to fight them off but in the end was killed. Just as his mother was ready to give up hope some Wookiees came just in time and quickly put an end to the pirates. They took Daereon’s mother to their home where she soon after gave birth. She named the child Daereon after his father and within the week was able to return to her homeworld. As Daereon grew he was always troubled by the fact he did not have a father, but what disturbed him even more was the fact that he knew such unjust things happened daily in their galaxy. Wanting to do something about it and feeling he somehow owed it to the memory of his father Daereon said his goodbye to his mother and went to join the Jedi. As Daereon started to learn more about the Jedi along with exploring the temple he came to know many people. The first he met was a Jedi named Atrux Nuro a kind Padawan who was nice enough to show Daereon around. Now Daereon being quite curious certainly had a lot of questions, but also hated to be a bother to anyone as he usually had to do things for himself. That being the case he would only ask a question if he truly found it necessary, but there was one question that everyone constantly asked him. That being why he wore a blindfold. Every time he was asked this Daereon would annoyingly reply it was because he was a Miraluka, but in all honesty he despised this fact. Having been trapped in his own home for so long Daereon rarely ever went out, but when he did it was only to go off world. As such he would constantly be teased or made fun of for wearing a blindfold or being called blind. This fact caused Daereon to hate being a Miraluka, and he often wondered what it was like to see with human eyes. However, this soon changed when Daereon made his first real friend with a Jedi Padawan. This Padawan’s name was Sebastin Creed, and he too was also a Miraluka. In fact besides Daereon he was the only Miraluka that resided in the temple. As Daereon got to know Sebastin and learn more about his own race’s culture and heritage he began to appreciate what he was. More importantly he learned about two connections. One being the connection of his sight with the force, and the second being the connection he made with Sebastin. To this day still he calls Sebastin brother as many Miraluka do, but for Daereon this would be the first time. He would eventually learn more about his own connection to the force, and in time use this to his advantage when it came to learning the abilities the force offered. As time would go on Daereon would make many friends from other hopefuls to Jedi knights, one in specific being Aslyn Denethorn who was at the time a Padawan, but also known as the hopeful baby sitter or leader of the Helmet army. Daereon would often follow Aslyn around asking him all kinds of questions which Aslyn would happily answer, but the times when Aslyn wasn’t around Daereon would usually keep to himself. Usually doing nothing other than sparring, or attending the classes that went on around the temple. However that all changed on the day a small Twi’lek child was found in the temple gardens. The child’s name was Fane Ornn’ila, and at first she could not understand much of what Daereon or anyone else was saying. It would seem that she only would respond to the language of the Twi’leks, but Daereon was content with Miralukese and basic and did not care to learn a third language. As such he did not pay much attention to Fane, but that would soon change. After a while Daereon noticed some of his friends getting initiated. Such as Z’phos, Yulia Cera, and Valon Rachius. Though he did not know them long Daereon enjoyed the time he had with them, but all that seemed to vanish once they had become official students of the Jedi Order. However this did not discourage Daereon for long as he still continued to learn what he could, and still spend time with Sebastin. Still Daereon slowly started to feel himself become alone, but that all changed when he ran into a familiar little blue face. Fane now having a much better concept of the basic language was now one of Daereon’s closest friends. Along with Zeak Dystiny, and Jacen Ginos the four would spar,play, and study all they could together. Whenever they were not at a class, they were outside talking or enjoying a good game of splash or beam spar. Being the oldest out of the small group Daereon tried to look out for the others, but in time learned that they would all help each other learn and grow. More time went by and Daereon had felt he finally found the place he belonged. He had found a home in the temple, along with new friends, and a new dream. He along with Fane, Zeak, Jacen, and two others hopefuls that Daereon would get to know as Ametha Tasia and Zekii all shared the same dream of becoming Jedi. They all had their own reasons, but all agreed that it was something worth the wait. As they would sit on the balcony of the temple and talk about what kind of Jedi they wished to be Daereon always looked into the stars happy that weather his dream would come true or not he was with people he trusted and cared for. However in time the dream would come true as Daereon and his friends all felt a call to the council room. When they arrived they were all nervous, and the starring eyes along with the questions and test of the Councilors did not make it any easier Though in the end it was all worth it when The Jedi Council announced that they all had been accepted as Initiates of the Jedi Order. On the date 269.30 Daereon’s dream had come true, but his journey had only just now begun. Daereon along with Fane, Zeak, Jacen, Ametha, and Zekii had all become a part of the Nexu clan. Each of them was eager to begin training, and they all started to learn quickly. Some things took more time than others though. While Daereon did have a good grasp and get a quick handle on saber combat, his skills in the force still took much longer to develop. However when he took the time to be patient and trust in himself he soon discovered a whole world of possibilities just waiting to be discovered Although, while their training continued on with the several knights and masters that offered their help, the main one being Aslyn Denethorn who by this time had become a Jedi knight; Daereon slowly but surely felt himself start to drift away from the others. For a while Daereon thought it was all in his head, but soon realized he was wrong. It was all true, he no longer saw his friends nearly as much, and the times he did he found himself too busy to spend time with them. For a short while this situation was a struggle for Daereon as he felt he was not only being left behind, but surpassed as far as training went. This though would not last long when he heard the words of Jedi Councilor Cyril Feraan. “I am not telling you to merely focus on yourself, but to understand everyone moves and learns at their own pace.” These words sunk deep into Daereon, and he never forgot them. From that point on he was not depressed but motivated to do even better to not only keep up with his fellow initiates, but to excel and so his very best. As time would move on Daereon would see and feel himself growing and getting better each and every day as he learned something new. From the physical hard working classes of Master Kevari’s saber classes, to the historical knowledge gaining of Master Alkorda’s history class Daereon felt himself get better at all he tried. Though there were certain classes he could not make he still did his best to either make them up, or simply get some one on one time with the masters. He would not even stop there Daereon would constantly try and learn more from Master Denethorn as well as other masters such as Jedi Knight Ergo Stomi, Rash Loist, Kaelen Sekura, and many others who were all willing to help him learn. His teachings did not stop there either, with help from his brother Sebastin along with all the different kinds of experiences he had with the other Jedi Daereon would find himself passing exams, learning new abilities, and even making more new friends. Daereon had now become a better person than he had once thought possible, but never let that thought stop him from trying to do better. He continued to train his body and mind through saber combat, meditation, and studying in the archives. Joining him was once again his old friends Fane who Daereon now considers his own little sister, Zeak who is known as Daereon’s best friend and partner, and Jacen who Daereon always feels the need to help out and give advice when he can. Daereon was happy to be able to spend more time with his friends, and learn along side them. Together they sparred, attended classes, and went through numerous crazy yet fun exercises. Daereon truly felt as if things were back to normal, but that would soon change as Jacen himself started to drift from the others. To follow up Zeak and Fane were both taken as Padawans by Aslyn Denethorn and Kaelen Sekura. Though this time Daereon refused to let such things get to him, and in fact this time he found himself quite happy for the both of his two friends. 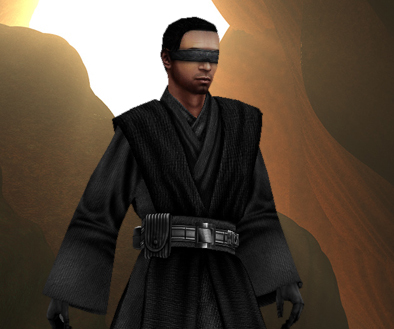 Daereon now continues to push forward and discover just what kind of Jedi he will be, and remembers to keep his promise he made on the day of his initiation nearly two years ago. This promise was to become the very best Jedi he could be, and no matter what obstacles come Daereon has decided he will keep his life long promise. Now a days Daereon spend most of his days training, and doing numerous physical activities. While he does his best to keep a balance between his force abilities and his saber skills he seems to continue to get drawn back into swinging his blade around one way or another. Even now he has been studying the several saber forms, and marks that the Jedi have developed, and has had quite a few sessions with Jedi Knight Stomi who Daereon has come to respect, and enjoy sparring and learning from. Though he has no master of his own at this time he seems to find a teacher of some sort in just about everyone. Weather it is practicing his force sense with Fane, or his saber combat with Master Stomi. Daereon only continues to grow, and better himself in hopes of becoming a true Jedi Knight. Recently Daereon has been spending late nights with Jedi Knight Ergo Stomi. He would constantly have enjoyable spars with master Stomi, and even the occasional conversation. However Daereon and Ergo both seemed to enjoy using their sabers to speak with each other, but whenever Daereon had a problem he knew he could come to Master Stomi for help. Such as recently with the death Of Jedi Knight Marr Daereon has had more problems understanding death, and why the force would allow such a thing to happen. However, through meditation, and guidance from Ergo Daereon has learned that the force guides everything, and that all we can do is learn to accept and follow it’s will. This is only the first of many lessons that Daereon will learn from Master Stomi as he trains under him as his Padawan. Daereon knows that the journey will be hard, and Ergo himself said that there may be times where he will regret saying yes to accepting him as a master. However Daereon knows that in the end this was the best choice for him, and that it will only help him to better himself as both a person, and a Jedi. Atleast, that is what he thought for the few cycles he spent with his master. Daereon and Ergo would often discuss different aspects of the force, along with each line of the code. Ergo would usually talk about each line in detail with Daereon, and have him meditate on it afterwards to see what he could come up with pertaining to the meanings. Daereon found this to be quite bothersome at first, but soon found himself enjoying it as his discussions with his master continued to get more in depth. Of course nothing made Daereon happier than to simply spar with his master as they often did before and after each session. However as time went by Daereon soon found the difficult part of Master Stomi’s training to come more and more as he warned it would. From having to run multiple laps around the courtyard, to pushing large crates back and forth across the courtyard, and even various arm and leg drill Daereon found himself doing numerous exercises. Many would think some of what he did would be a bit extreme for a mere eleven year old boy, but Daereon never complained as his only desire was to do his best, and make his master proud. In time however Daereon would soon see just how proud Ergo truly was of him, but this would only make the pain of lost even greater. He never saw it coming, infact it was the last thing he thought would ever happen to him. After haven been given Ergo’s old saber hilt from his time as a padawan, Daereon felt that he and his master had truly connected. He knew how much the hilt meant to Ergo, and knew that the fact he trusted him with it mean that he had to take care of it. More importantly it made him feel that he and his master were closer than ever. Of course that all soon changed once Master Stomi left on a mission. He told Daereon it’d only be a coulple of days, but a whole cycle went by until Daereon finally got the news. Jedi Knight Ergo Stomi had left the Jedi Order. The new shocked Daereon, and what was worse was the fact Jedi Master Kevari, and Jedi Knight Ferorn two members of the council had also left right before. Daereon couldn’t believe it after all Master Stomi had told him, and taught him it seemed as if everything had be thrown out the window. His first reaction was surprise of course, but soon after came sadness and in time anger. The anger of the thought that he had not only been abandoned by his master, but without so much as a good bye no less. Daereon felt a mixture of emotions, but all of his friends and fellow Jedi did thier best to comfort him. Some with words of wisdom, some words of encouragement, and others very stern words of truth. However in the end that’s all it was to Daereon, just words empty words with no real meaning. He felt all he was doing was getting lectured, but that soon changed when Jedi Padawan Johauna who had also lost her Master, being Master Kevari was the only one who seemed to truly understand him. Not only because of the fact that she too had lost her master, but that both she and Daereon trained under Master Stomi. Even though it was only a few cycles the pain Daereon felt was all too real, and by sending warm feelings to Daereon of compassion and sympathy Johauna showed just how much she hated to see Daereon suffered. This in time led Daereon to talk to Johauna, but he was interrupted when Jedi Knight Iverian Prey appraoched him telling Daereon that the way his was acting was understandable but not needed. “The fact is as great of a knight as he was, Master Stomi was never that good of a teacher anway.” The words of Master Prey burned Daereon, was it the fact that his former master was insulted, or the fact that all Master Prey was doing was simply telling Daereon to get over it. He wasn’t sure, but it didn’t matter as Daereon quickly lashed out at Iverian saying he had no right to speak of Master Stomi that way, and that if it was wrong for him to vent his feelings that was just too bad. The arguement quickly ended with Daereon having to write up an assignment on the positive and negative aspects of his Master leaving. In the end however, the assignment opened up Daereon’s eyes as he realized that all Master Prey was telling him was simply to accept how things were and move on. He understood that Master Stomi would not want him to simply waste time being angry and confused about his lost, but rather push forward and work even harder to become the Jedi he knew he could. In the end it seemed to Daereon that all Master Stomi had taught him was infact for the purpose of him understanding just that. That even though the force works in ways we cannot always comprehend, it is simply better to accept it and move on with its flow rather than push against it. From then on Daereon decided to turn his anger and sandess into motivation, to get stronger and become the better at all he worked at. Not only for himself, but also for his former master who he promised to one day find and give a true spar on equal terms as he always said he would. However, he would not have to do this alone and according to Master Xarbon as long as he always did his best, he never would. Master Aeon Xarbon with these words took Daereon as his Padawan Leaner, and Daereon’s training continued. Though now it would go from a balanced learning, to a much more physcial one as Aeon swore to turn Daereon into the Jedi Guardian he knew he could be. From then on Daereon’s training took a very aggresive turn as he focused more and more on saber combat and technique with less training in the force. However he still worked on what he knew, and even managed to improve on his abaility with force sense all for the purpose of trying his best to remain balanced despite his Master’s wishes. That of course did not stop Aeon from constantly working Daereon’s body with various activities and physical exercises all having to do with the saber one way or another. In time though it was all worth it as on Daereon’s twelfth birthday he was given Master Stomi’s old hilt back once again. To this day he still doesn’t know how Master Xarbon got a hold of it, but being a guardian he is sure taking it from Daereon’s chest of belongings was not too hard. He never complained about it though as he ignited it with a satisfied smirk of knowing that Master Xarbon’s crystal was now inside. It was as if to Daereon now holding the hilt of his former master with the crystal of his current master inside, that both Ergo and Aeon would forever fight beside and be a part of Daereon’s life. With his new full frequency saber in hand, and his training hilt left behind Daereon spent everyday practicing even more now in the hologram training room. He would soon find himself in the room just as much as his Master was, one of many traits he felt he may gain from his new Master. Of course this did not keep Daereon from doing his best to train in other aspects as well, still reamaining a Sentinel he did his best to find time to train in the ways of the force everyday. As he continued to grow stronger Daereon would soon notice a change not only in his mind set, but also see an early devlopment in his body as his physical capabilties continued to expand. Being frequently told by his master and even his good friend and feollow padawan Simus Cnydaria that he was quite strong for his age. Daereon found himself quite happy and being able to keep up with the older padawans at his younge age, and even quite often beat them in a series of spars. However the more Daereon noticed his devolopment in training, the more he noticed his lack of social skills among his fellow Jedi. Sure he would talk to his close friends such as Zeak, and Fane along with others within his padawan clan from time to time. Still Daereon knew he had drifted quite a bit from the others with being so focused on getting better, he forgot that a Jedi would often at times need to talk his away out of situations using diplomacy not brute force. Daereon then decided to spend more time with the others going on more outtings, and joining in on group activites, such as Jedi Knight Kaelen Sekura’s stealth and infiltration exercises. He soon found himself happily enjoying his time with his friends again, and would soon find himself spending more time talking with Jedi Padawan Azra’elre’nim who seemed like a very quiet person who much rather spend his time in a book than holding a conversation. However Daereon soon found himself getting to know Azrael better than ever before as he hears of his life story, and even starts to see a more competitive side of his friend with every spar they have. More importantly though Daereon felt that by talking with and getting advice from Azrael it could help him to fix a certain other relationship he needed help with that being his friend Johauna. Ever since seeing Daereon with Master Stomi’s hilt she seemed to have had a slight resentment to Daereon. This however only pushed Daereon to reveal more about himself and his connection with Master Stomi, and to Joh’s surpise his great respect he has had for her since being a hopeful nearly four years ago from the current time. Building his relationships back up with his old friends, and learning more about his fellow Jedi as he makes new ones Daereon slowly felt himself starting to feel content. Of course this content feeling did not stay long as Daereon started to seek more than the daily training he had in the temple walls. Having hated being confined to only his home back on Alpheridies due to his mother’s constant worry, Daereon felt that he was once again becoming a prisoner in his own home. He longed to go out into the galaxy quite simply to get away more so than explore new places. He also felt that his master Aeon Xarbon was so focused on saber combat, that he forgot about Daereon’s wants and needs in the aspect of learning more about the force. However, Aeon soon put Daereon’s mind to rest as he told Daereon that the time would soon come where they would go out into the galaxy. Not only because he did not wish for Daereon to be confined to the temple as he once was, but also to teach Daereon greater techniques and uses of the force. Daereon simply had to be patient, and wait till he had a better grasp of the basics. Knowing this Daereon simply focused more on his training in mere hopes of being able to leave the temple from time to time in order to learn and gain more knowledge of the force. Daereon did indeed finally get his wish after some time went by, and the season of Life Day approached. Daereon was quite excited about the off world trip with his fellow Jedi, and not only to get away from the temple but because he was also returning to the place of his birth. Daereon didn’t know much about Kashyyyk as he only went there occasionally with his mother to visit his father’s grave. However, he did know that it was where his father’s life ended and his own began. Master Xarbon assured Daereon that he would indeed feel a strong connection to the planet, but little did Daereon know that he would not have to look far. Till then however he simply enjoyed the flight with his friends talking, enjoying group activities, and even getting caught in his first nova storm. The flight all in all was an enjoyable time for both Daereon and his friends. Although all he could truly focus on was what all he could possibly discover once he reached the place of his birth. When the time came to finally land Daereon certainly was ready to hop off. It had been a long flight, and the excitement of being somewhere new yet famaliar at the same time gave Daereon new energy to explore and discover all he could. Although it wouldn’t be until after he, Fane, and Zeak all reunited with an old friend. Seeing Jacen on Kashyyyk after so many years filled Daereon with a mixture of emotions, some of which he had been holding in for so long. Though he was always the first to defend Jacen saying he must have had good reason for leaving without saying anything. The fact was simply that Daereon could not stand the fact that Jacen had left only because he felt he was getting behind in training. Offended at the fact that Jacen felt thier friendship was made of something so shallow, Daereon spoke to Jace the only way he could think of. By punching his close friend right in the nose, and even breaking it. After having tried to talk to Jace for so long Daereon decided there was no other way to get through to him. Although he didn’t quite get the reaction he wanted. After going through a long talk with both Jacen, Master Ferorn, and Master Loist. Daereon felt he had finally settled things with his old friend, but at the cost of losing his saber. However, Daereon felt this was a small price to pay for the sake of saving his friendship. Though after that first day on Kashyyyk Daereon has yet to see his little friend again. However he, Fane, and Zeak didn’t let it get to them as they continued to explore, climb, swim, and eat just about everything they could on the planet. They bonded with the native wookies and became even closer to eachother as the cycle went by, and Daereon truly felt at home despite only having been there a short time. Little did he know that this was the very connection his master had mentioned earlier, but Daereon not understanding that still sought for answers. Even though he always said he never cared about having a father the fact is that strong desire was still inside him. This simply made Daereon the perfect prey for a certain entity that wanted control. On the last day on Kashyyyk Daereon felt desperate and was constantly looking for some answers. He looked everywhere for where his father was burried as well as searching for the site of where he and his parents first crashed land. However, in the end Daereon ended up being found by someone else. At first Daereon believed the strange entity before him to be his father, and quickly agreed to follow it around doing whatever it asked. However after digging up a strange object, being knocked out by a blinding light, and waking up on a side of a mountain Daereon soon realized whatever was with him was not his father. Still he felt he had come too far seeking answers to quit now so continued on. The more Daereon listened to and followed the entity the stronger its hold on him was. What at first seemed to be an old harmless miraluka spirirt, soon appeared to be a twisted figure which was determined to use Daereon for it’s own purposes. Although with the help of his brother Sebastin, and his two friends Fane and Zeak Daereon managed to fight against the enetity within him and regain control. Though to this day the incident still plagues him despite not being able to remember it all. However, Daereon now holds a metallic tube which the entity had forced him to dig up while controlling his body. At the time he felt it was best to not open it, and leave well enough alone. It would not be the last Daereon saw of the object however, nor the last time Daereon would encounter the strange entity. Back on the Yavin lV temple Daereon continued his regualr training. However, he now focused more on his mind and spirirt instead of just his body. Meditating everyday to strengthen his mind and spirirt, while training his body to its fullest at night. Daereon has become determined to make sure such an incident never happens again. Now relying more on the guidence of his Master as well as the bond he shares with his friends, Daereon has learned to accept help from others. Rather than relying on his own abilities and understanding. It is but the first of many things Daereon faced as his new path to becoming a Jedi Guardian continued. Nearly a year later, things seem to start to slowly get back to normal in Daereon’s life. His training continues to progress, his bonds with his friends grow, and his relationship with Master Xarbon only continues to become more stable as Master and Padawan. However, all of these parts of Daereon’s life would soon be tested by the very same being Daereon believed he had left behind on Kashyyyk. On a typical day, Daereon was playing around with Fane Ornn’ila as he quite often did. As they chased eachother around Fane playfully kicked Daereon down into the small pit of the Duel room they were in. However, despite the small fall when Daereon landed he went out cold. First believing it to be a joke Fane simply giggled, but as more time went by Daereon continued to lay there motionless. Now worried Fane quickly rushed to Daereon’s side, but only to be grabbed by her shoulder. Daereon reamained out cold yet his hand held a firm grip. Fane’s confusion of what was going on was soon replaced however with the fear of the old famaliar voice in her head saying “I told you I would never forget your face.” Shock now ran through Fane as she realzied the entity she believed to be left on Kashyyyk was still dwelling within Daereon. The question was however, would he believe her once she told him? The fact is Daereon at first was uncertain once Fane finally told him what had happened. He had been feeling fine lately, and saw no reason to believe he was still possessed in any form or fashion. Still despite Daereon’s constant denial the entity continued to torture Fane’s mind sending many disturbing images of Daereon causing her harm, and even killing her. Trying to push the horrible thoughts away Fane started to cling more closely to Daereon’s best friend Zeak Dystiny. Daereon had noticed over the years how close his two friends had become, and quite often wished to speak to them about it as he felt he was being left behind in their friendship. He quite often thought of himself as a third wheel, but feeling they would simply reject what he had to say Daereon kept his hidden feelings within. Though he didn’t realize it at the time, the mysterious entity within him was only biding its time as it started to play off these very emotions Daereon had. By using his anger, frustration, and jealousy the entity would soon reveal itself to Daereon but it would be all too late. Daereon continued to try and prove that he was feeling fine, but in time a dream would show him just how wrong he truly was. In Daereon’s dream he would see himself as a young boy once more, standing between two lights. One light was a dark blue which represented his own aura though he did not realize it at the time, and the other light being a dim green represented the entity’s aura. Daereon would always allow himself to walk into the blue light, but still constantly pondered as to what his dream meant. Speaking with Fane and Zeak about it, despite his feelings towards them at the time slowly helped Daereon to understand that his dream meant. However. the closer Daereon got to understanding what was going on inside him, the further he grew from those around him. He would constantly argue with Fane and Zeak saying they were only rejecting him because of their fear. Zeak who simply was doing his best to help both Fane and Daereon tried to talk sense into Dae, but only to have it tossed back in his face. Daereon’s resentment to his best friend only grew as he felt he was becoming an enemy while Zeak was the hero to stop him. These thoughts were Daereon’s own, but the entity soon would use them to take advantage and control. As more time went by Daereon felt he was himself less, and less. He could never focus long enough to meditate, had become much more aggresive in his saber combat, and was now avoiding his friends entirely. Still he could never hear the voice of the entity in his head as Fane, and Zeak claimed to. Though one night while Daereon was asleep the entity took over him, and now moved freely through his body. The entity called onto Fane having her meet with him. Thinking it was Daereon she of coruse came feeling he was finally ready to open up to her. She was however, quite surprised when she heard the echo of two voices come from Daereon, one being his, and the other being one she recognized as the voice in her head. The being told Fane that she and Zeak were wasting time trying to reach Daereon, and that it was their fault that he gained control in the first place. It claimed that the more Zeak and Fane were around Daereon the easier it was to control him through his negative feelings. Fane of course was heart broken to hear such words but didn’t back down saying she would never give up on her brother. The entity simply laughed at such a statement telling her that as long as she continued to interfer he would continue to make her suffer. Fane’s only choice was to let Daereon go, but this was something she could not do. When Daereon finally came to he found himself quite surprised at the fact he was out of bed, let alone infront of Fane. She slowly told him of what all had happened, and what the entity had said. Daereon listened quietly, but then asked almost out of no where. “Is it true, that you care for Zeak more than me?” Fane was taken back by the question, saying that it would be like choosing between a father and mother. Daereon rejected this answer feeling she was only saying so because she didn’t want to admit the truth. He was tired of feeling they were getting closer as he was being pushed aside. All of his mixed feelings that he had kept inside for so long were now being released, and not for the better. Fane broke down in tears trying to get Daereon to see the truth of what was happening. He simply walked off however, saying that the term Nerra she used for him was nothing but a bad joke. At this point Daereon felt the best thing he could do was simply stay away from Fane and Zeak. Not only for his sake, but for their safety as well. Little did he know this was exactly what the entity wanted. For Daereon to slowly become alone, and thus leaving himself open to the twisted being’s voice. Daereon now able to hear and communicate with the entity wanted answers as to what it wanted with him. It only stated that Daereon needed to finish what he started on Kashyyyk, but Daereon refused to go back there. The being then threatned that he would have Daereon kill both Fane and Zeak if he did not comply, and from then on the sick twisted visions both Fane and Zeak experienced also went through Daereon’s mind. Knowing he had no where else to turn to, and could no longer keep it a secret Daereon spoke to his master. Master Xarbon had planned to go back to Kashyyyk eventually to check things out from the incident on Life Day, but it would seem his trip would be happening a lot sooner than he thought. It took a while for preparations to be made, and the longer he had to wait the worst Daereon got. Still despite this both Fane and Zeak tried to comfort their friend. The suffering was getting worse for all three as the entity continued to torment them with sickning words, and horrible visions. Fane and Daereon especially could no longer sleep, and Zeak was becoming even more tired with trying to support both of his friends. In the end however, the final straw was drawn. When Daereon had once again gotten into a violent arguement with his friends, he approached his master. He was tired of all of the pain and unanswered questions, but most of all he wanted to be free of the apparent spirit within him. Aeon understand Daereon’s pain, but to better understand the situation he needed to speak with this entity. Knowing it was the only way Master Xarbon slammed his fist into Daereon’s stomach whispering in his ear, “We shall get through this together, my Padawan.” With that Daereon was knocked out cold, but the entity was now wide awake. It looked to Master Xarbon who was now also accompanied by Kenta, a Chistori Jedi Padawan who had become very close to Daereon, Fane, and Zeak over the years being a big brother to the group. Master Xarbon wasted no time in asking the entity what it wanted, but the being only laughed through Daereon saying it was none of Aeon’s concern. Master Xarbon then demanded that the being release Daereon, but the entity simply replied saying ” Or what, will you beat me out of him? Surely you aren’t willing to hurt your own precious padawan.” With that the entity retracted itself back within Daereon’s mind. Daereon looked up to his master rubbing his stomach with a confused look. “Ugh, what was that for Master, and what happened.” Master Xarbon calmly replied saying “It’s good you have learned to take a hit…now pack your things, we are going to Kashyyyk.” With that Daereon, Master Xarbon, Zeak, Fane, and her Mastter Jedi Knight Sekura all left for Kashyyyk to get some answers, and be rid of this evil spirit. Once the five had arrived on Kashyyyk, Master Xarbon had Daereon try to remember what all happned that Life Day. Retraing his steps Daereon came to the shore of the Wookiee’s island camp where he had first dug up a strange orb like object as the entity had him do. Daereon had never quite figured out what the object was as when he tried to open it, a bright light consumed him and knocked him out. Daereon then remembered that he also had brought another small object back to the temple with him. A small metallic tube that he had dug up when under the control of the entity. He had given it to Sebastin for safe keeping over the past year, but being aware of the situation Master Xarbon had brought the tube with them. Still despite this Daereon suddenly began to feel frustrated as he dug along the shore once more, not being able to find the orb like object. Though he didn’t know why at the time Daereon suddenly felt compelled to find the orb at all cost, feeling it may have been his only possible way of being free of the entity. Going off on his own Daereon found a small wookiee cub who in actuality was about Daereon’s height, upon a tall tree platform. In the wookiee’s paws was the very orb Daereon was searching for. By this time the other had caught up to Daereon, but he didn’t even seem to pay any notice to them. In a very frustrated manner he demanded that the wookiee give him the orb, but thinking it was a toy the wookiee refused. It claimed in its own language that he had found the orb, and saw no reason to hand it over. This only caused Daereon’s anger to rise, despite not being able to understand it Daereon could tell the wookiee had no intention of returning the orb. Master Xarbon did his best to calm Daereon, and try to talk to the wookiee. However, not fully understanding the situation the wookiee tucked the orb away in its pouch and started to walk off. That is when Daereon snapped, and suddenly felt himself black out hearing only the voice of the entity within his head. Now controlling Daereon the entity walked forward to the wookiee, and aggresively grabbed the pack. “I will not allow some worthless creature like you to stand in the way!” With that the entity used the force to push the young wookiee over the edge of the tree platform. The screams of the wookiee could be heard from miles away until it landed on the ground with a thud. Then there was nothing, but silence and the laugh of a twisted voice coming out of Daereon’s mouth. After finally getting over the intesne shock of what had just happened both Fane and Master Sekura rushed all the way down to the bottom of the large tree hoping by some mircale the wookiee survived. They were however, too late and before they could think of what to do, the loud roar of the wookiee’s father was heard behind them. Meanwhile at the top of the tree Daereon still controlled by the entity was demanding that Aeon hand over the metallic tube, saying that the truth would finally be revealed. Master Xarbon refused however, trying to talk some sense into Daereon, but despite his words Daereon could not hear a thing as he was now locked in the back of his own mind. Just as Master Xarbon and Zeak were about to be forced to fight their own commrade, both Fane and Master Sekura returned to the top of the tree along with a very angry wookiee. Zeak reacting quickly tried to get infront of the wookiee to speak, but only to be smacked away to the side. The wookiee demanded to know who had killed his son, and the entity able to understand the wookiees after being on Kashyyyk for so long calmly stated that he did it. In rage the wookiee charged Daereon, who was already prepared to kill, but was suddenly stopped as Master Xarbon stepped inbetween the two. “Please, for your own sake I have to ask you to back down.” Master Xarbon calmly stated to the enraged wookiee who was ready to rip off Daereon’s head for taking the life of his son. It took some of Master Xarbon’s best negotiating skills but he was finally able to convince the wookiee to let him handle this. In exchange though the Jedi would all have to leave, as the wookiee claimed there would be no peace as long as that creature was here. The entity knowing the wookiee was refering to him simply chuckled as he went along with Master Xarbon and the others heading back to the ship. As the other three continued Master Xarbon and Daereon stopped at the base of the tree. The entity knowing how skilled Master Xarbon was in saber combat due to Daereon’s memories felt fighting him would be pointless. With that he put Daereon’s hilt to his own head claiming that if Aeon did not hand over the metallic tube, he would ignite and take Daereon’s life. Master Xarbon asked what the entity would possibly gain from doing so. The entity simply replied he would go to any extent if it meant revealing the truth to his son. That is when Master Xarbon finally understood, the entity inside of his Padawan was the spirit of Daereon’s own father. Or as Master Xarbon put it, the twisted remains of his father. With that Aeon tossed the tube to Daereon, but the moment he caught it Aeon swiftly slammed him into the wall knocking the entity out. When Daereon came too he was himself again, only to see Master Xarbon talking with Master Loist who had come along with Kenta as back up. It was then that Daereon heard his master say that the being inside Daereon was his own father. Daereon was shocked, and couldn’t bring himself to believe it. Still what truly tore him up inside was the knowledge that his father had not only taken control of him again, but this time had also taken a life as well. While Master Loist went to talk to the father of the wookiee that was killed to ensure peace between the wookiee race and the jedi, Daereon sat with the others looking at the two objects in his hands. The voice of Daereon’s father continued to go through his mind showing him the image of him taking the wookiee’s life. Not knowing what else to do Daereon took the metallic tube and opened it up, in which inside he found a small key. He then inserted the key into the orb which unlocked, and what Daereon found inside would change his life. It was simply a small flight data chip, which apparentally had some sort of recording on it. Daereon did not know what to think at this point as he and the others flew back to the Yavin lV temple. He had come all this way to get answers, but now simply had more questions. Ontop of that he felt he had taken a life, but his Master assured him that it wasn’t his fault. Still Daereon was not convinced, and felt guility that so much pain had been caused all over such a little chip. The biggest concern for Daereon however, was the fact that his own father was the one causing all of this. From what his mother had told him, Daereon believed his father to be a kind, strong, and brave man who even gave his own life on Kashyyyk to save both Daereon and his mother. Still now he wasn’t sure what to think of his father, or even himself. Once they reached the Jedi Temple Daereon was restrained in a cell, as Master Loist felt it was the best way to keep Daereon and his fellow students safe. As he was left alone in the cell with his close friend Kenta keeping watch, Daereon finally let out all of his feelings. He told Kenta about everything, from the time the whole sitatuion started and even before then. Most importantly though he talked to Kenta about how he was feeling when it came to Fane and Zeak. After a long talk and explanation, Daereon finally understood the truth though. Kenta quite simpy stated that perhaps Zeak and Fane were becoming closer in a new way, but that never meant that they were pushing Daereon out of the picture. They would still always be there for him, and he would always be there for them. Nothing could change their friendship, and Daereon soon felt himself feeling stupid for not realizing something so obvious. Just because his two friends were becoming closer never meant he was getting further away, but his father had twisted his own thoughts to meke Daereon feel otherwise. Daereon however now knew what needed to be done, and after a long mental session with Master Loist he was able to be let out of the cell. Although without his lightsaber, but despite this Daereon finally fixed things with his friends, apologizing and explaining how he truly felt. With that he, Zeak, and Fane all felt they had become closer, but it didn’t change one major fact. Daereon still knew that his father was deep within him, but for the sake of Zeak and Fane’s sanity he kept that to himself. Daereon used all of his strength to constantly keep his father surpressed within the back of his mind, and because of it his father wasn’t able to send any images or messeges to anyone. Still Daereon knew he could not keep it up forever, and ignoring his father’s call would only last for so long. Keeping this in mind, both Daereon and Master Xarbon finally decided to load up the flight data and see what this supposed truth about Daereon’s past was. The flight data recording showed two people on a ship, who were verified as Daereon’s mother and father. The two were apparentally fighting over where they were going. Daereon’s mother at the time believed they were heading for Alpheridies, but his father had other plans. He was saying that they were going to take Daereon to a man who had come to them once, before Daereon’s mother was even pregnant. “Ever since you met that horrid man, you’ve changed! Just listen to yourself!” Daereon’s mother lashed out. Daereon’s father simply tried to calm her down as he explained, “Don’t you see, this is what is best not only for him by the enitre Miralukian race. Think about it when our original home planet was destroyed, no one helped us. Well it is about time we strike back at the galaxy for not coming to our aid, and it all starts with our son!” Daereon’s mother simply shook her head in frustration. “That was hundreds of years ago if not more, our home is Alpheridies now and we have never had a problem with that. Why are you behaving this way? Our son deserves a normal life with his family, and you want to take that away from him? Daereon’s father was now starting to look annoyed.”What I want is for our son to have what he deserves, think about it we Miraluka are a species far superior to any other who are born with the abilities of the force. However, what he spoke to us before verifies that our powers can go beyond that of our sight! If we allow him to train out son from birth, think about the possibilities and all he could do for our people!” Daereon’s mother had enough and refused to listen she demanded that they continue on to Alpheridies, and that she would not give up her son to a sick twisted man like “him.” Daereon’s farther ignored her however saying that it was his son, and he would decide what was best for him. With that Daereon’s mother quickly pulled out a blaster pistol from her husband’s belt. Daereon’s father was taken by surprise but quickly reacted trying to stop her, but this only caused the blaster to go off. The shot fired right into the ship’s controls and with that the ship crashed landed on the nearest planet. That planet was of course none other than Kashyyyk. Daereon’s father at this point refused to listen to a word his mother said, and walked to the console trying to repair the controls. “Just you wait..when we get back to Alpheridies you’re going to learn a lesson about disrespect.” With that Daereon’s mother did something that he couldn’t believe. She quickly picked up the blaster and shot Daereon’s father right through the head, tears contining to stream down her cheek. Daereon sat there in shock looking at the screen, unable to look away as several thoughts ran through his head, and mixed feelings tore at his heart. Master Xarbon allowed the data to play on however. It showed Daereon’s mother doing her best to try and repair the controls, but only to collapse over in pain as it was past time for her to give birth. Daereon watched in fear almost as if he was unaware of the fact that both he and his mother survived. That is when a man in strange clothing entered into the ship and quickly helped Daereon’s mother into the back of the ship. After quite a bit of time on the recording goes by, Daereon can hear the cries of a young baby. The strange man then returns in view on the console screen and is seen taking the body of Daereon’s father out of the ship. In time the man returns with some tools which he uses to repair the ship’s controls and take off. That is all that was shown on the data recorder, and Daereon was left speechless. After deciding to organize a meeting with the council on the matter Master Xarbon suggest to Daereon that he gets some rest. And that is exactly what he did, for the next two days Daereon did not leave his room as he thought on all that had happened. He could not wrap his mind around all of it at once. Why his mother had kept the truth from him, who the person was that his father was so eager to take him to, and just who was the man that not only saved his mother’s life but delivered Daereon himself as well. All of these questions plagued Daereon’s mind, but more importantly he wanted to know why it is the mysterious man who showed up on the screen looked famialiar. Daereon hadn’t known that many people before he came to the temple as his mother had always kept him locked up in the house. Daereon always believed she did this to keep him frim tragically dying as his father did, but only now did he understand she may have been trying to protect him from more. Whatever the reason though, Daereon remembered his mother would only let him out of the house when they would go off world which wasn’t often. Infact he only remembered going off world to Kashyyyk to spend time at his father’s grave. Which brought up the question was that even where his father was really burried? Daereon then decided the only way he could find out the truth was if he went and spoke to his mother himself. However, he was well aware that that task may be impossible as long as his father resided in him, and especially if he wanted revenge against his mother. Daereon not knowing what else to do, finally decided to speak with his father. Removing the mental barrier he had worked so hard to keep up, he allowed his father to speak to him through his mind. Surprisingly his father did not seem angry, but rather quite happy that Daereon had finally seen the truth. They discussed all that had happened, and what Daereon had seen on the flight data. Yet despite all of it his father refused to answer any questions about the man who he was going to take him to. He simply claimed that Daereon did not belong with the Jedi, and that the only way he could truly survive would be if he sought out the man on his own. Daereon of course refused to do any such thing, and told his father that it was past time he left his body. His father however told Daereon that his time was almost up regardless and he would soon leave his body. Daereon was relived at this, but at the same time confused. He asked why it is his father only had a set amount of time he could be within Daereon. His father simply chuckled and repeated” The only way you will find any answers is if you go to him. And trust me trying to get the answers out of your wretch of a mother will do you no good!” With that Daereon’s father took over him one final time, and with his mental defenses down Daereon could do nothing to stop him. To say Zeak and Fane were surprised once Daereon came to them with the voice of his father once more is an understatement to say the least. However this time it seemed all Daereon’s father wished to do was speak to Zeak alone. So after consulting Master Loist Zeak followed Daereon to the shrine, but only did this knowing Fane, Kenta, and Master Loist were all watching from a distance. Daereon’s father then turned to Zeak asking him what he was to Daereon. It seemed that during all this time Daereon’s father could not understand why it is Daereon cared so much for Zeak when he was all the time trying to get him to resent him. Zeak simply responded saying that they were best friends, and nothing Daereon’s father did could change that. At that momen Master Loist reached into Daereon’s mind waking Daereon up. Daereon’s father lashed out trying to push Master Loist back, and the pressure took quite a toll on Rash physically. However Daereon now awake refused to let the back and forth go on, he fought against his father to push him out of his mind. Master Loist assured Daereon that his destiny was his own, and that only he could decide how to find the truth. His father still fought against it though saying that only he knew what was best for him. Daereon felt as if his mind was being ripped apart, and didn’t know if he could keep trying. That is when Master Loist reminded him that there was no try, he either had to do or don’t. With that Daereon used all of his strength to force his father’s essence out, and with the continuation of Master Loist’s help he did just that. The twisted remains of his father vanished from Daereon’s mind and spirit, but not before saying “You will always belong to me Daereon…and you shall never belong here.” Daereon then woke up to see Kenta, Fane, Zeak, and Master Loist gathered around him in the shrine. All Daereon could do was stare at them all until he started to laugh in joy. He could finally feel the presence of his father gone, and Master Loist only confirmed it by going through his mind. Daereon could not remember a time he had ever been so happy to just be alive in his own body, by himself. What made him happier though was the fact he could finally be with his sister Fane without having her look at him with fear. It took a while for them all to finally accept that it was over, but in time things slowly started to return to normal. Since then Daereon has had to struggle with many different challenges through out the years. The first being the death of his mother. A Dark Jedi by the name of Varian who had been responsibile for bringing back the broken spirit of Daereon’s father had taken her life in order to further draw Daereon into the dark. This only added to the intense stress Daereon was already going through. His Master had suddenly gone missing (To this day Aeon Xarbon is still M.I.A), the Jedi Order was being banned from Galatic Alliance space, and the Mandalorians had risen up against the Jedi Order. This was all due to the Mandalore being supposedly killed by a Jedi, and even after the supposed Jedi turned himself in, it seemed that only blood would appease the Mandalorians. To make matters worst the Chiss Ascendancy had risen against the Commonwealth. War was now upon the galaxy, but Daereon along with the rest of the Jedi Order were forced to stay out of it as they searched for a new home. Yavin lV had been over taken by the Mandalorians, and the entire section of the Order was now on the run. Despite such rough circumstances however, Daereon refused to give into despair and continued to stand strong with his friends. Now senior padawans he along with Fane and Zeak did their best to support the younger and newer students during their travels for a new home. Through it all though the Dark Jedi Varian continued to try and torment Daereon’s mind in order to convince him to seek him out. Thankfully however at this point Jedi Knight Ergo Stomi had returned, and feeling it was his duty taught Daereon ways to defend against telepathic attacks. From then on Daereon’s relationship with his old mentor grew. The Yavin section of the order at this point however were running low on supplies, and having no other choice landed at an old abandoned palace on Tatooine. There they made a temporary home, but this did not last due to constant attacks from Tusken Raiders. During this raids, Daereon learned the harsh lesson of having to take a life, but because of it he grew stronger mentally. From then he on he swore that he would never take a life unless he was left with absolutely no other alternatives. After no longer being able to deal with the constant attacks of the Tuskens, the Jedi Order moved across the desert to the Raddyx company’s plant that was stationed on Tatooine. Due to Baelin Raddyx who was not only a student of the order, but also the son of Ebon Raddyx the owner of the company, the Jedi were allowed to stay there for a brief time. At this point Daereon had also managed to learn to fully block out Varian, but to be on the safe side seperated himself from his close friends. No longer having the patience to wait, Varian tracked down Daereon at the Raddyx station. There he lashed out at Daereon and his friends, but his efforts were in vain as Jedi Master Kevari, along with four other Jedi Knights finally struck him down. Daereon couldn’t believe that the man who had caused him and his family so much suffering was finally gone, but he certainly didn’t complain as he could now finally focus fully on the current matters that were going on around him. Without anymore distractions he could dedicate his time soley on his training, and at this point it was well needed. Eventually, the Yavin lV section of the Order left Tatooine, and traveled to Alzoc lll where they stayed at a small camp in the lower mountains. There Daereon was able to enjoy the peace and joy along with his friends, as well as settle some final disputes with Zeak and Fane concerning the three’s relataionship. Things were finally beginning to look up for Daereon, and on 280.10 Ergo Stomi once again took Daereon as his Padawan Learner. Both of them saw this coming, and Daereon was happy to once again be under Ergo who had helped him through many hardships. However at this point the majority of Daereon’s training was complete as he had learned much on his own. So Ergo knew that anything else he could teach Daereon would be out in the field. Getting field experience wouldn’t be too difficult either, because at this point the Galatic Alliance had called off their ban for the Jedi. The war was becoming too much for them, and they needed help. After much consideration and debate, Daereon joined the Coalition forces along with his Master. Around this time the Alzoc lll Enclave had also been built for the Jedi Order. Now having a real home, a Master, and new position as Lieutenant Commander in the Coalition Daereon Daimon continued to learn and progress. Between his training under Ergo Stomi, and many difficult assignments involving both the war and Dark Side related acitivites Daereon learned a great many things. From more advanced force abilities, to new moral tennents, and of course the hardships of war. As the years went by Daereon steadily continued to advance and mature, but the war was only becoming more chaotic. Through it all Daereon had lost many friends from Masters such as Knight Sekura, Knight Tholmai to many soldiers he had formed a bond with during his missions in the war. Eventually many other Jedi also went M.I.A during their assignments, and Jedi Knight Ergo Stomi was one of them. Knowing that he could not afford to be discouraged Daereon continued to carry on in his training and duties. He was soon rewarded for this, and on 284.29 Daereon Daimon was made a Jedi Knight by the Jedi Council of Alzoc lll. To this day Daereon continues to fight in the war against the Chiss Ascendancy and Mandalorians, but also remains diligent in both his training, and new responsibilities as a Jedi Knight.